As always, we ran the big playoff game — in this case, the "Super Bowl," as they're calling it — through Madden 11 on our PlayStation 3, and for the first time, everything's coming up green. 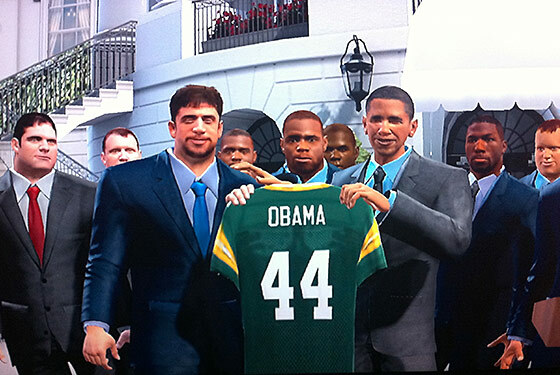 The virtual Packers beat the virtual Steelers 14–11, in a weird little defensive battle. Ben Roethlisberger threw two interceptions, including one in the final two minutes, to secure a fourth Super Bowl win for the Pack. Running back James Starks was the hero, running for 115 yards and two touchdowns. Considering the Jets are 0–6 in all of our PS3 simulations over the last two years, we're a little surprised they didn't find a way to lose this one too. Our PS3 will now rest until April, when we simulate the Knicks games in NBA Playoffs on NBA 2K11. Assuming, of course, they make it.